A 2008 Obama donor who was considered for the position of secretary of Commerce has supported a joint project between his company and the embattled Chinese telecommunications company Huawei. 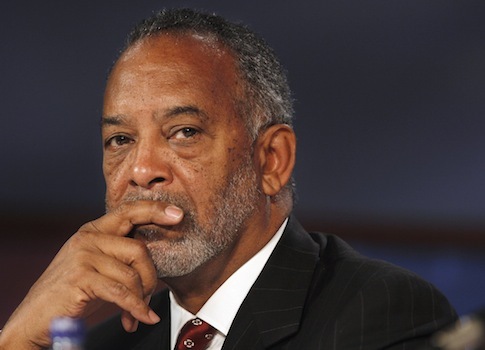 John W. Thompson, former CEO and board chairman for Symantec, supported a joint venture company formed by Huawei and Symantec in 2007. "Huawei's world-class product development and manufacturing capabilities joined with Symantec's leading edge security and storage software technologies will offer unique solutions that will give customers more confidence that their systems are secure and available," Thompson said in a statement issued jointly by Huawei and Symantec. He was under serious consideration for the Commerce Secretary position in early 2009, according to reports. Thompson and his wife were major donors to Obama’s 2008 Presidential campaign: both donated the maximum amount to Obama’s primary and general election campaign funds, and Thompson donated $50,000 to the President’s inauguration fund in 2009. Thompson held "at least two fundraisers at his Woodside, Calif., home," according to the Los Angeles Times. Further, records show Thompson’s wife was a major bundler for the Obama campaign, raising between $100,000 and $200,000, the Los Angeles Times reported. Huawei has aided a cyber warfare unit within China’s Peoples Liberation Army (PLA) in its research, a congressional report revealed Monday. The bipartisan House report, based on both classified and public information, concluded that the U.S. government and private sector face cyber espionage or data theft from software or hardware sold by Huawei or another government-linked telecommunications firm, Zhongxing Telecommunications, known as ZTE. This report comes as the White House recently suffered a cyber attack linked to the Chinese government. The joint venture was based in China, with Huawei holding majority control with 51 percent of the shares compared to Symantec’s 49 percent. Huawei said in the statement that they would "contribute its telecommunications storage and security businesses" as well as their "intellectual property (IP) licenses, research and development capabilities, manufacturing expertise and engineering talent, which includes more than 750 employees." The government report warns against using equipment from Huawei: "The investigation concludes that the risks associated with Huawei’s and ZTE’s provision of equipment to U.S. critical infrastructure could undermine core U.S. national-security interests." Huawei’s CEO Ren ZhengFei hailed Symantec’s "world-class security and storage technologies" in the joint Symantec-Huawei statement. "The partnership will enable us not only to provide leading network security solutions to carriers, but also to deliver professional security and storage solutions to enterprises, helping our customers build a safer and more efficient network," he said. Symantec provided "some of its leading enterprise storage and security software licenses" to the joint-venture company. Ren has directed a Chinese military intelligence unit in the past, according to the congressional report, and "his connections to the military continue." The report also indicated that the Chinese government has intimate access to Huawei’s leadership, and could coordinate activity with the company, raising fears of compromised security products. Barack Obama’s presidential campaign recently released an advertisement attacking Republican challenger Mitt Romney for a proposed Bain Capital deal involving Huawei in 2007, arguing Romney "refused to intervene" in the proposed partnership. Romney had left management of Bain in 1999, however. And Bain ended the deal because of national security concerns. The advertisement fails to mention both of these facts. Thompson, however, had no such qualms about the joint venture between Huawei and Symantec. The President ultimately selected Gary Locke as his Commerce Secretary, but Nancy Pelosi, at that time Speaker of the House, named Thompson to the Financial Crisis Inquiry Commission later that year. Neither Huawei nor Thompson’s office immediately returned a request for comment. This entry was posted in Politics and tagged Bain Capital, Democratic Donors, Financial Industry, Huawei, Mitt Romney, Nancy Pelosi, PLA. Bookmark the permalink.